June 2016 ISM PMI- Stronger Than Our Order Book! The latest Institute for Supply Management Purchasing Manager’s Index (ISM PMI) for June 2016 increased 1.9 percent from May 2016, the fourth consecutive increase in the index and the 85th consecutive month of increase in the overall economy. 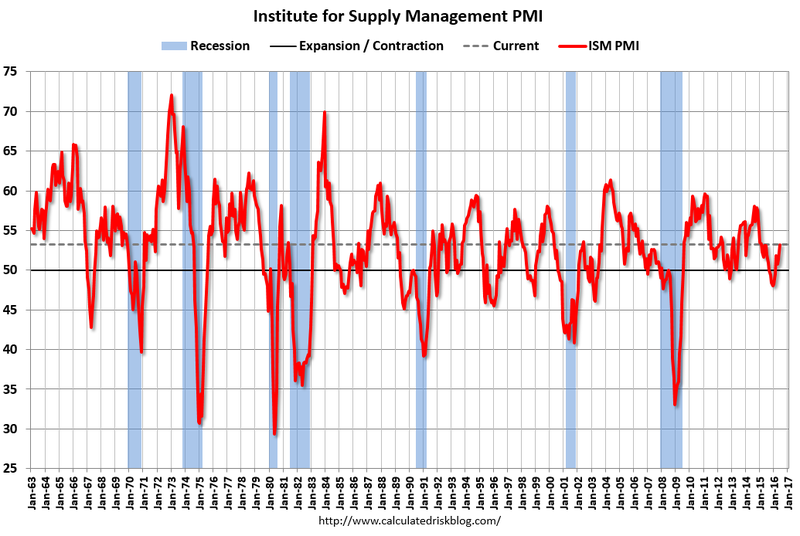 Is the ISM PMI a leading indicator for our precision machining shops shipments in the short term? In May 2016, the PMPA Business Trends Index declined 8 points or 6.6% to 114, its lowest value for the month since May 2011. A majority of respondents reported sales declines in May. We certainly hope that this ISM PMI is a leading indicator for our shops! This entry was posted on Monday, July 11th, 2016 at 10:53 am and is filed under Front Office. You can follow any responses to this entry through the RSS 2.0 feed. You can leave a response, or trackback from your own site.